Capnography (end-tidal CO2 monitoring) is a non-invasive measurement of carbon dioxide in exhaled air to assess a patients’ ventilatory status. It may also be referred to as partial pressure end tidal carbon dioxide monitoring (PETCO2). The end-tidal CO2 (EtCO2) level is a reflection of global CO2 production in the body. Cardiac function, pulmonary function, and metabolic rate all influence the amounts of CO2 produced. The end-tidal CO2 provides information on systemic CO2 production (from exhaled alveolar gas), pathologic dead space, pulmonary blood flow, and confirmation of endotracheal tube placement. Capnography allows trending of CO2 levels using fewer arterial blood gas analyses, but does not completely replace arterial blood gas analysis. Age, smoking, general anesthesia, and systemic diseases can increase the difference between the CO2 value obtained from non-invasive monitoring and arterial blood gas monitoring. Note that capnography measures ventilation, not oxygenation. patency is lost, no other treatment modalities can prevent death. Alveolar volume (Va) – Air that is available for gas exchange, which is typically about 350 cc (Vt – Vd = Va); Anything that affects the tidal volume only affects the alveolar volume. Bradypnea – slower than normal rate (<10 breaths/min), with normal depth and regular rhythm. Associated with ICP, brain injury, and drug overdose. Capnogram – the wave form. Capnography – the measurement of carbon dioxide (CO2) in exhaled breath. Capnometer – the numeric measurement of CO2. Hypoventilation – Shallow, irregular breathing. Slow breathing (bradypnea) does not necessarily decrease tidal volume. Causes include CNS disorders, narcotic use and others. PACO2 – Partial pressure of CO2 in the alveoli. PaCO2 – Partial pressure of CO2 in arterial blood. 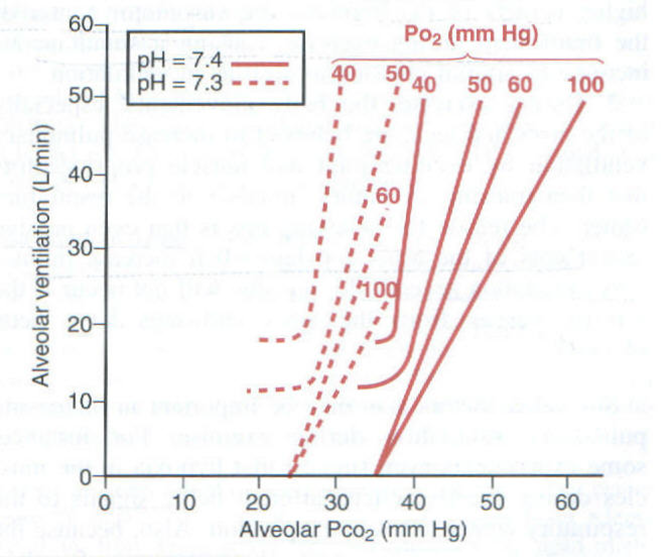 (a-ET)PCO2 – Arterial to end-tidal CO2 tension/pressure difference or gradient. 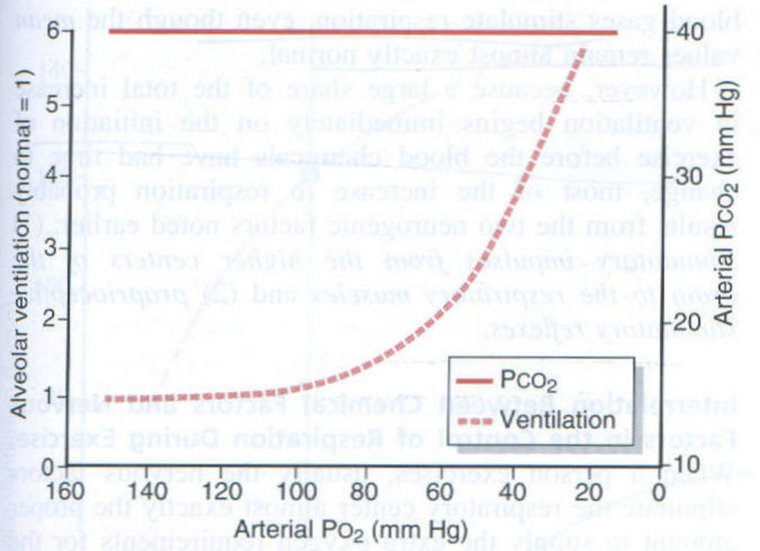 PvCO2 – Partial pressure of CO2 in mixed venous blood. 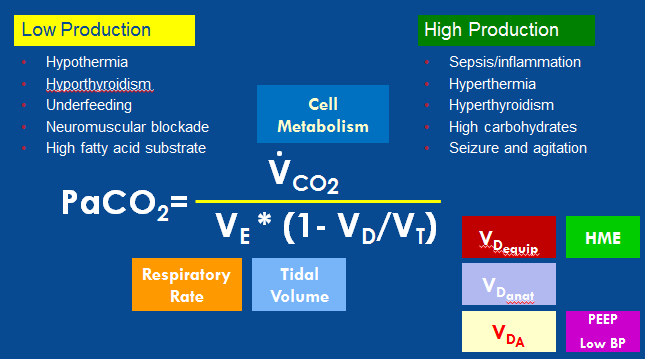 Respiration (or diffusion) is measured by the amount of oxygen in the blood. Tachypnea – rapid, shallow breathing (>24 breaths/min). Associated with pneumonia, pulmonary edema, metabolic acidosis, septicemia, severe pain, or rib fracture. Ventilation is measured by the amount of carbon dioxide in the blood. The lungs are cone-shaped organs that hold between 4 – 8 liters of volume. The top portion is known as the apex, and the bottom is known as the base. The apex of each lung rises above the clavicles a few centimeters and the base rests against the diaphragm. 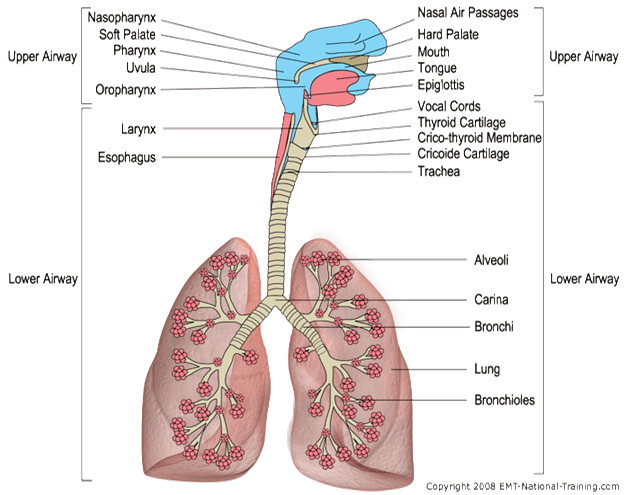 The right lung has 3 lobes: upper, middle, and lower. The left has two lobes: upper and lower. Aspiration pneumonias are often located in the right middle lobe due to the shorter, straighter right mainstem bronchus. The diaphragm is the major muscle of ventilation. It is a dome-shaped musculofibrous partition located between the thoracic and abdominal cavities. It is composed of two muscles: the right and left hemidiaphragms. The diaphragm allows the esophagus, the aorta, several nerves, and the inferior vena cava to exit through it. The phrenic nerve exits the central nervous system between cervical vertebrae 3 – 5 and extends down to innervate the diaphragm assisting in controlling ventilation. Patients with cervical spine injuries of C3, C4 and C5 are often dependent on mechanical ventilation. This is due to interruption of nerve transmission to the diaphragm and other ventilatory muscles. During vigorous exercise and the advanced stages of pulmonary disease processes (e.g. COPD) the accessory muscles of inspiration and expiration are activated to assist the diaphragm. The constant 0.863 is necessary to equate dissimilar units for VCO2 (ml/min) and VA (L/min) to PACO2 pressure units (mm Hg). Alveolar ventilation is the total amount of air breathed per minute (VE; minute ventilation) minus that air which goes to dead space per minute (VD). Dead space includes all airways larger than alveoli plus air entering alveoli in excess of that which can take part in gas exchange. In the clinical setting we don’t need to know the actual amount of CO2 production or alveolar ventilation. We just need to know if VA is adequate for VCO2; if it is, then PaCO2 will be in the normal range (35-45 mm Hg). Conversely, a normal PaCO2 means only that alveolar ventilation is adequate for the patient’s level of CO2 production at the moment PaCO2 was measured. 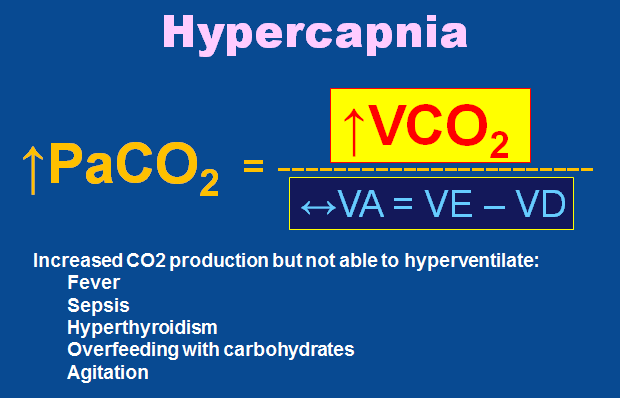 From the PCO2 equation it is evident that a level of alveolar ventilation inadequate for CO2 production will result in an elevated PaCO2 (> 45 mm Hg; hypercapnia). 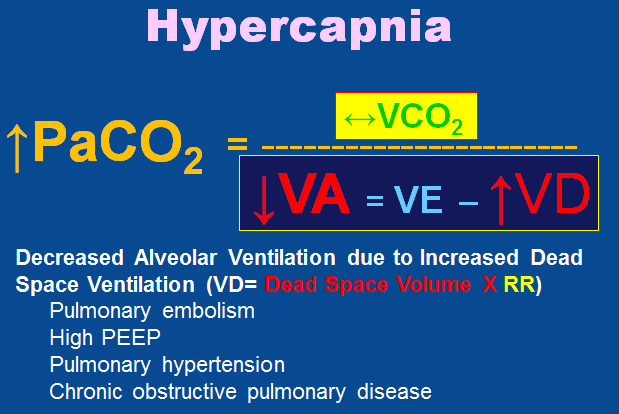 Thus patients with hypercapnia are hypoventilating (the term hypoalveolar ventilating would be more appropriate but hypoventilating is the conventional term). 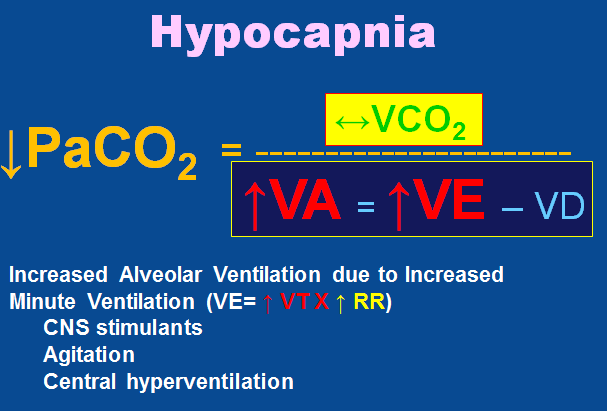 Conversely, alveolar ventilation in excess of that needed for CO2 production will result in a low PaCO2 (< 35 mm Hg; hypocapnia) and the patient will be hyperventilating. (Confusion sometimes arises because the prefix (hyper-, hypo-) differs for the same condition depending on whether one is describing a blood value or the state of alveolar ventilation.) 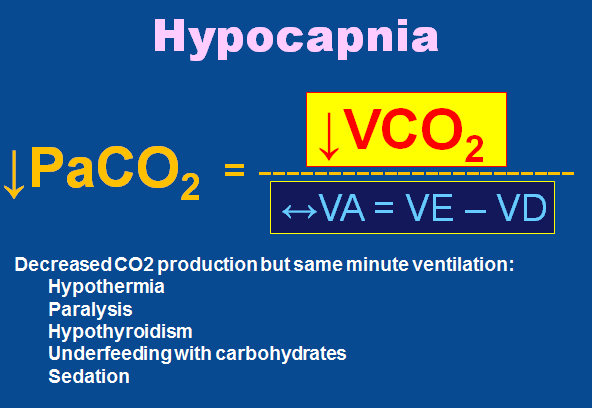 For reasons that will be discussed below, the terms hypo- and hyper- ventilation refer only to high or low PaCO2, respectively, and should not be used to characterize any patient’s respiratory rate, depth, or breathing effort. 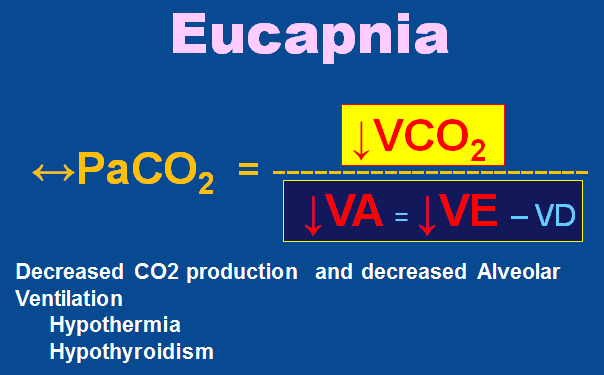 Excess CO2 production is omitted as a specific cause of hypercapnia because it is never a problem for the normal respiratory system unimpeded by a resistive load. 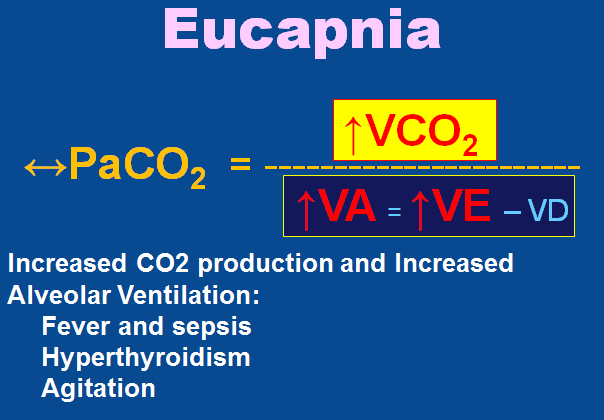 During submaximal exercise, for example, where CO2 production is increased, PaCO2 stays in the normal range because VA rises proportional to the rise in VCO2. 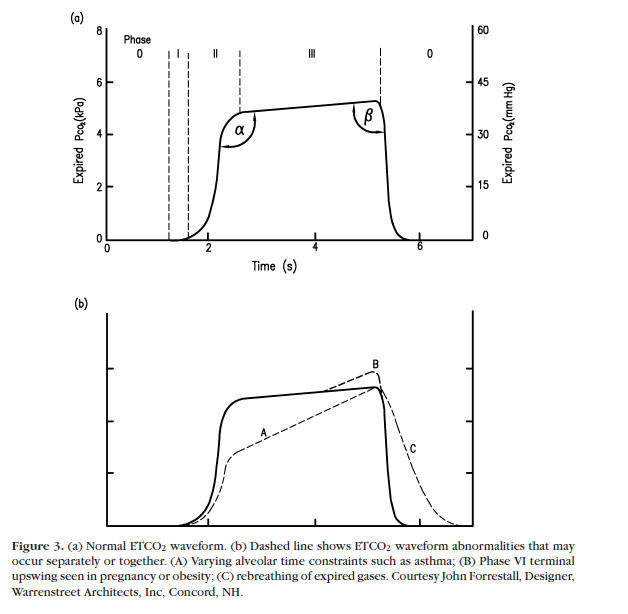 With extremes of exercise (beyond anaerobic threshold) PaCO2 falls as compensation for the developing lactic acidosis. In a healthy patient PaCO2 may be reduced but is never elevated. An important clinical corollary of the PaCO2 equation is that we cannot reliably assess the adequacy of alveolar ventilation – and hence PaCO2 – at the bedside. Although VE can be easily measured with a handheld spirometer (as tidal volume times respiratory rate), there is no way to know the amount of VE going to dead space or the patient’s rate of CO2 production. Other clinical factors include respiratory effort, mental status, body habitus, temperature, etc. A common mistake is to assume that because a patient is breathing fast, hard and/or deep he or she must be “hyperventilating.” Not so, of course. 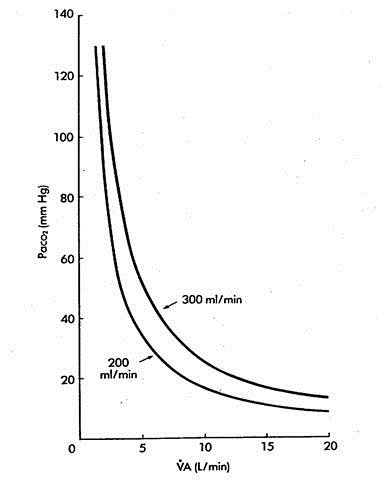 The relationship is shown for metabolic carbon dioxide production rates of 200 ml/min and 300 ml/min (curved lines). 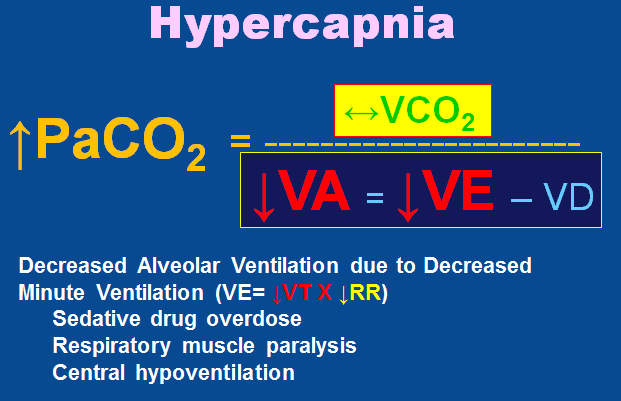 A fixed decrease in alveolar ventilation (x-axis) in the hypercapnic patient will result in a greater rise in PaCO2 (y-axis) than the same VA change when PaCO2 is low or normal. This graph also shows that if alveolar ventilation is fixed, an increase in carbon dioxide production will result in an increase in PaCO2. Guyton & Hall, Textbook of Medical Physiology, 10th ed., 2000, Saunders p. 477. The effect of PCO2 on ventilation is primarily due to a region of the ventral medulla referred to as the chemosensitive area. In this area, there are sensor neurons that are excited by hydrogen ions. As arterial PCO2 rises, CO2 easily and rapidly diffuses through the blood brain barrier where it combines with water to form carbonic acid which releases a hydrogen ion. So, the net effect of increased arterial PCO2 is increased cerebrospinal fluid (CSF) and brain interstitial acidity. This strongly stimulates these sensor neurons which stimulate the respiratory centers to increase ventilation (this will tend to reduce the arterial PCO2 back to baseline). Hydrogen ions themselves do not diffuse as easily across the blood brain barrier making the direct effect of pH less. 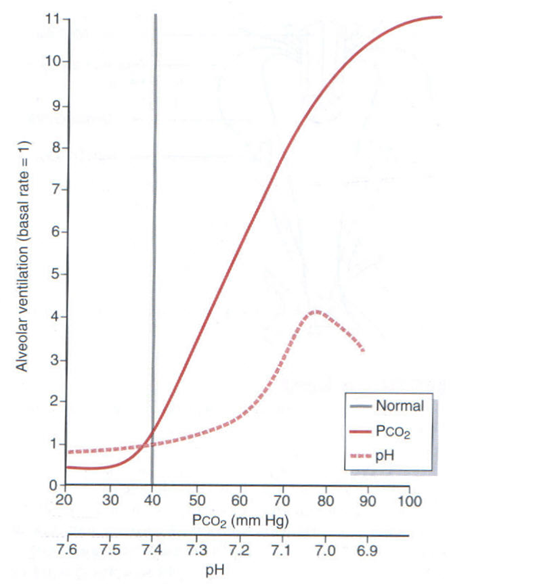 The effect of PCO2 on ventilation is strongest in the acute phase. If the person has a high PCO2 for a prolonged period (days or longer, perhaps due to a lung or neurological problem), the pH of the CSF tends to return toward normal because of adaptive effects related to bicarbonate. The person becomes accustomed to the higher PCO2 and it causes less stimulus to hyperventilate. Guyton & Hall, Textbook of Medical Physiology, 10th ed., 2000, Saunders p. 479. Currently, there are 2 basic types of CO2 detectors: quantitative and qualitative. Qualitative CO2 detectors are colorimetric detectors that contain material that reversibly reacts with CO2. This reaction causes the color to change, most commonly, from purple to yellow. Qualitative capnography units can be broken down into mainstream and sidestream configurations. Mainstream units, or in-line units, are used for ventilated patients who are intubated endotracheally. The sensor is placed directly on an adapter attached to the endotracheal tube. From there, EtCO2 can be directly measured. Sidestream units have a sensor that is located on the main unit itself. These systems aspirate the gas sample from the patient’s airway, which then measures the EtCO2. In turn, sidestream units can be used in awake or intubated patients. Quantitative CO2 detectors give a measured value of EtCO2. This numeric value is referred to as capnometry. Quantitative detectors can also be displayed as a waveform called a capnogram. This waveform of inspiratory/expiratory CO2 can be displayed over time or volume and is referred to as a capnograph. “α” (Alpha) angle – Used to assess the Ventilation/ Perfusion (V/Q) status of lung. During mismatches, the alpha angle is > ~ 90 degrees. The more damaged and less uniform the alveoli, the larger the angle. Bronchospasm (sharkfin), COPD, etc. “β” (Beta) angle – Used to assess rebreathing. During rebreathing, the beta angle is > 90 degrees. May see in infants who are breathing faster than capnograph can account for. A normal capnogram look like the following. Is it steep, sloping, or prolonged? Is it flat, prolonged, notched, or sloping? One of two sure signs of endotracheal intubation. This is probably the most common use of capnography, yet limiting oneself to this use only is a huge waste. In the beginning, color change devices would detect CO2 levels. This is widely believed to be able to accurately predict when the endotracheal tube is misplaced in the esophagus. Theoretically, there should be no CO2 exhaled from the esophagus, on the trachea. However, in low perfusion states, this is not a very accurate reading and the manufacturer even suggests using another confirming device besides this one. Therefore, waveform capnography is the gold standard for endotracheal tube confirmation. Tube confirmation is confirmed with a SQUARE waveform. With a square waveform, the tube cannot be in the esophagus, or the hypopharynx. It must be in the trachea, regardless of the value of the return of CO2. Right mainstem intubation. A square waveform can occur with a right mainstem intubation because the tube is still in the main airway.Therefore, auscultation in the fifth intercostal space midaxillary, bilaterally, is necessary to rule out right mainstem intubation. Detection of untoward events e.g… Disconnections or inadvertent extubation. As an assessment tool during CPR, capnography is a direct measurement of ventilation in the lungs, and it also indirectly measures metabolism and circulation. For example, a decrease in perfusion (cardiac output) will lower the delivery of carbon dioxide to the lungs. This will cause a decrease in the ETCO2 (end-tidal CO2), and this will be observable on the waveform as well as with the numerical measurement. Two very practical uses of waveform capnography in CPR are: 1.) evaluating the effectiveness of chest compressions; and 2.) identification of ROSC. Evaluating effectiveness of chest compressions is accomplished in the following manner: Measurement of a low ETCO2 value (< 10 mmHg) during CPR in an intubated patient would indicate that the quality of chest compressions needs improvement. An abrupt increase in PETCO2 may indicate return of spontaneous circulation (ROSC), Increase in pulmonary circulation brings more CO2 into lungs for elimination. In most cases that have ROSC the ETCO2 goes into the 70-90’s! Generalized seizure, such as a tonic/clonic, can affects both hemispheres of the brain and the medulla. When the medulla is involved, the patient may not breath during seizure activity. Following the post-ictal state capnography can determine the need for further ventilation. CO2 is not getting to the lungs to be exhaled. sudden drop in perfusion that is picked up immediately on a capnogram. allowing O2 to dissociate from hemoglobin, make the brain injury worse. There are a few specific waveforms that you need to know. A, Prolonged phase II, increased α angle, and steeper phase III suggest bronchospasm or airway obstruction. B, Expiratory valve malfunction resulting in elevation of the baseline, and the angle between the alveolar plateau and the downstroke of inspiration is increased from 90°. This is due to rebreathing of expiratory gases from the expiratory limb during inspiration. C, Inspiratory valve malfunction resulting in rebreathing of expired gases from inspiratory limb during inspiration (reference 5 for details). D, Capnogram with normal phase II but with increased slope of phase III. This capnogram is observed in pregnant subjects under general anesthesia (normal physiologic variant and details in reference 9). F, Baseline is elevated as a result of carbon dioxide rebreathing. G, Esophageal intubation resulting in the gastric washout of residual carbon dioxide and subsequent carbon dioxide will be zero. H, Spontaneously breathing carbon dioxide waveforms where phase III is not well delineated. I, Dual capnogram in one lung transplantation patient. The first peak in phase III is from the transplanted normal lung, whereas the second peak is from the native disease lung. A variation of dual capnogram (steeple sign capnogram – dotted line) is seen if there is a leak around the sidestream sensor port at the monitor. This is because of the dilution of expired PCO2 with atmospheric air. J, Malignant hyperpyrexia where carbon dioxide is raising gradually with zero baseline suggesting increased carbon dioxide production with carbon dioxide absorption by the soda lime. K, Classic ripple effect during the expiratory pause showing cardiogenic oscillations. These occur as a result of to-and-for movement of expired gases at the sensor due to motion of the heartbeat during expiratory pause when respiratory frequency of mechanical ventilation is low. Ripple effect like wave forms also occur when forward flow of fresh gases from a source during expiratory pause intermingles with expiratory gases at the sensor. L, Sudden raise of baseline and the end-tidal PCO2 (PETCO2) due to contamination of the sensor with secretions or water vapor. Gradual rise of baseline and PETCO2 occurs when soda lime is exhausted. M, Intermittent mechanical ventilation (IMV) breaths in the midst of spontaneously breathing patient. A comparison of the height of spontaneous breaths compared to the mechanical breaths is useful to assess spontaneous ventilation during weaning process. 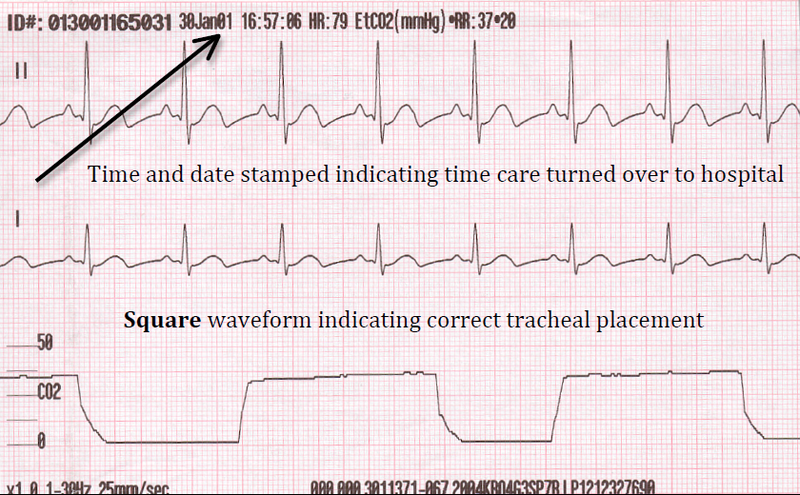 N, Cardiopulmonary resuscitation: capnogram showing positive waveforms during each compression suggesting effective cardiac compression generating pulmonary blood. O, Capnogram showing rebreathing during inspiration. This is normal in rebreathing circuits such as Mapleson D or Bain circuit. Emergency Nurses Association – Wave Form Capnography The 12 Lead of the Lungs! This entry was posted in Medical, Nursing and tagged Capnography, medical, nursing, Respiratory on April 26, 2013 by rjjaramillo.